This application note will examine the chemical recovery process and explain how the ADMAG AXF magnetic flow meter can provide the mill with one of the most reliable and accurate measurements for these difficult applications.Many chemicals are used in the pulp and paper making process. Since some of these chemicals are recycled and reused, it is important that the plant measures and controls them to improve profitability and efficiency. In the digester, wood chips and "white liquor", a mixture of sodium hydroxide (NaOH) and sodium sulfide (Na2S), are combined and cooked in a pressure cooker type device. The cooking process breaks down the lignin, which is the glue that holds the wood fibers together. The spent mixture of white liquor and lignin is known as "black liquor". The black liquor is concentrated in several stages through evaporation, by heating with steam, until it consists of approximately 66% solids. The concentrated black liquor is then burned in the recovery boiler. The burned black liquor produces a residue of molten chemicals or "smelt" consisting of sodium carbonate, sodium sulfate and sodium sulfide. The smelt is now referred to as green liquor due to its color. By adding water and lime, the green liquor is processed through the lime kiln and turned back to fresh white liquor that can be used again in the digester. Metering is normally required on the black liquor lines into the concentrator and the recovery furnace. In addition, metering of green liquor in the recausticizing process is also required. 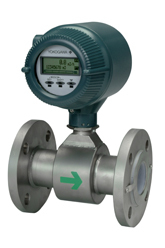 Conventional meters using single low frequency DC excitation (6.25, 12.5, 25 Hz etc.) can suffer from slurry noise due to the entrained organic particles in the black liquor. High frequency AC meters that use 50, 60 Hz excitation do a good job of reducing slurry noise, but have problems with zero stability and providing accurate readings. As a result the accuracy is typically 1% of span. ADMAG AXF's dual frequency excitation has the advantages of both the high and low frequency meters. Dual frequency excitation provides fast response time (0.1 sec. ), good zero stability, accuracy of 0.35%, 0.2% as option of reading and immunity to slurry noise. Further, the "Enhanced Dual Frequency Excitation Method" is optionally introduced in the ADMAG AXF to cope with more difficult application such as high concentration slurries and low conductivity fluid measurement. Non-retained liners (extruded liner), which are commonly used in conventional meters, are susceptible to failures as a result of vacuum conditions that can be created due to a pump or valve failure. In addition, meters that have extruded liners generally have a shorter life due to the aggressiveness of the chemicals used in the recovery process. Yokogawa uses an injected molded PFA liner with a retaining grid. This retaining grid plate, used to reinforce the PFA teflon liner, acts like rebar in concrete. This rugged construction holds the liner in place and prevents the liner from caving in due to vacuum conditions. The thickness and durability of the injection molded PFA liner provides a flow tube that is capable of handling the most severe applications. Black, white, and green liquors coat the inside of flow tubes causing an insulating coating to cover the electrodes. When this occurs the meter output will go to zero or into alarm (empty pipe). The ADMAG AXF magnetic flow meter introduced fluid adhesion level diagnosis which always monitor the level of insulating material buildup on the electrodes, which enables maintenance timing can be recognized. With the utilization of ADMAG AXF's replaceable electrode typeflowtube, electrodes can easily be removed and cleaned without removing flowtube from piping. In case of adhesion on line, the maintenance procedure is usually to remove the meter and using some type of scraping tool, remove the coating that has developed. Again the conventional meters with the exposed electrode seal are susceptible to electrode seal damage when this type of cleaning technique is used. Once the electrode seal is damaged the meter is doomed to fail. Since the ADMAG AXF seal is removed from the process the meter can be easily cleaned with no effect on the electrode seal. Yokogawa's dedication to providing the highest quality flow meters has given pulp and paper manufacturers a meter that can hold-up to the most challenging applications. The use of dual frequency excitation, accuracy of 0.35% of reading,and field-proven electrode and lining construction offers the customer one of the most accurate, reliable and dependable meters available.